October 7, 2009: NASA is figuring out how to make water from moondust. Sounds like magic? "No magic--" says Ed Ethridge of NASA's Marshall Space Flight Center "-- just microwaves. We're showing how microwaves can extract water from moondust by heating it from the inside out." The recent discovery of water on the Moon's surface has inspired researchers like Ethridge to rev up the development of technologies to capture it. Some of them believe the small amounts of frozen water mixed in lunar topsoil are just the tip of the iceberg.1 If so, Ethridge has figured out a way to retrieve it. Right: Apollo 12 astronaut Alan Bean holds up a thermos full of moondust. Could this be transformed into a thermos of moonwater? NASA scientists are working on it. "We believe we can use microwave heating to cause the water ice in a lunar permafrost layer to sublimate – that is, turn into water vapor. The water vapor can be collected and then condensed into liquid water." "Best of all, microwave extraction can be done on the spot. And it requires no excavation -- no heavy equipment for drilling into the hard-frozen lunar surface." He calls his first mining experiment the "Moon in a bottle." 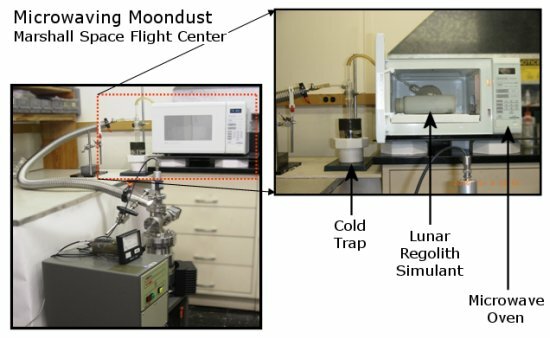 "We filled a bottle with simulated lunar permafrost [fake moondust containing water ice] and heated it in a microwave oven. The microwaves heated the simulant enough to extract water, even though the soil was as cold as it would be on the Moon." At least 95 percent of the water added to the simulant was extracted (vaporized out of the soil) with 2 minutes of microwaving. 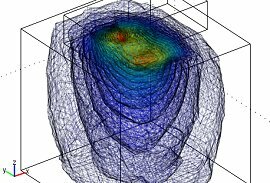 "And we were able to capture 99 percent of the vaporized water in our cold trap," says collaborator Bill Kaukler of the University of Alabama-Huntsville. "It works." Above: Ed Ethridge's experimental setup at the Marshall Space Flight Center in Huntsville, Alabama. Then Ethridge and his team moved beyond the oven to beaming microwaves into the simulant – the way it would have to be done on the Moon. The beamed microwaves were absorbed into the soil and heated it sufficiently to extract water. "This was an important demonstration. We had to make sure the microwaves wouldn't reflect off the surface," Ethridge explains. "It worked beautifully." "We've asked for some genuine soil from the Apollo missions," says Ethridge. "We want to test the real thing and calculate how fast the water vapor will come out. That's an important piece of information." "There are other things we need to know, like how much ice is at the poles, how deep it is, where it is -- is it only in the craters or is it everywhere?" This Friday morning, Oct. 9th, LCROSS (the Lunar Crater Observation and Sensing Satellite) could answer some of the questions about moonwater when it plunges into crater Cabeus at the lunar south pole to unearth signs of H2O. If ample water ice does exist on the Moon, how would lunar residents collect it? "They'd have to beam microwaves into the soil and collect the water vapor in a cold trap," he explains. "We want to build a prototype water prospecting experiment to demonstrate the technique we’d like to see used in a lunar water mining facility." He stops talking, looks up, and smiles. "I'd be willing to go up and set up the first Lunar Water Works -- if they'd let me." Footnote: 1Several days ago, NASA announced that the Moon Mineralogy Mapper, or M3, an instrument aboard the Indian Space Research Organization's Chandrayaan-1 spacecraft, discovered water molecules in the polar regions of the Moon. NASA's Cassini spacecraft and NASA's Epoxi spacecraft confirmed the find. Ethridge says: "The data [from the three aforementioned spacecraft] dealt with water detected from the top 1 or 2 mm of soil from regions like the Apollo sites, which are known to be "depleted" of any water (i.e., water produced from solar wind protons). But their data also shows much higher signals for water from the polar regions. The best locations for water ice are permanently shadowed craters near the poles. The water at the poles may be underneath a 1 cm depleted layer that overlies a higher concentration of water down to a meter deep. A few years ago, Lunar Prospector and Clementine produced data for hydrogen that translates to average concentrations estimated to be from 1 to 4.6 % water over large areas at the poles. Assuming an average 2 percent concentration, that translates to maybe 40 pounds -- about 5 gallons -- of water in a cubic meter of moon soil. (2 percent of a 1 ton is 40 pounds. A cubic meter of lunar soil is approximately 1 ton.)" Credits: Dr. William Kaukler of the University of Alabama-Huntsville was instrumental in the experimental and hardware setups for these experiments. Frank Hepburn of Marshall led the dielectric property measurements. Southern Research Institute is doing some measurements for team on the gas permeability of compacted lunar soil.